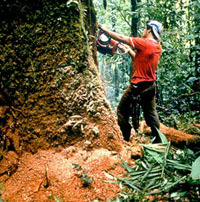 Tropical forests maintain nutrients in living plants rather than in the soil. When tropical forests are cleared, the ecosystem cannot regenerate, leading to permanent loss of species. 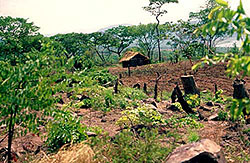 Primitive agricultural techniques and uncontrolled development are among the leading causes of environmental degradation in the tropics. Shown: A farm near Lake Tanganyika, Africa.